Herbig Ae/Be star, R Coronae Australis -- larger image. 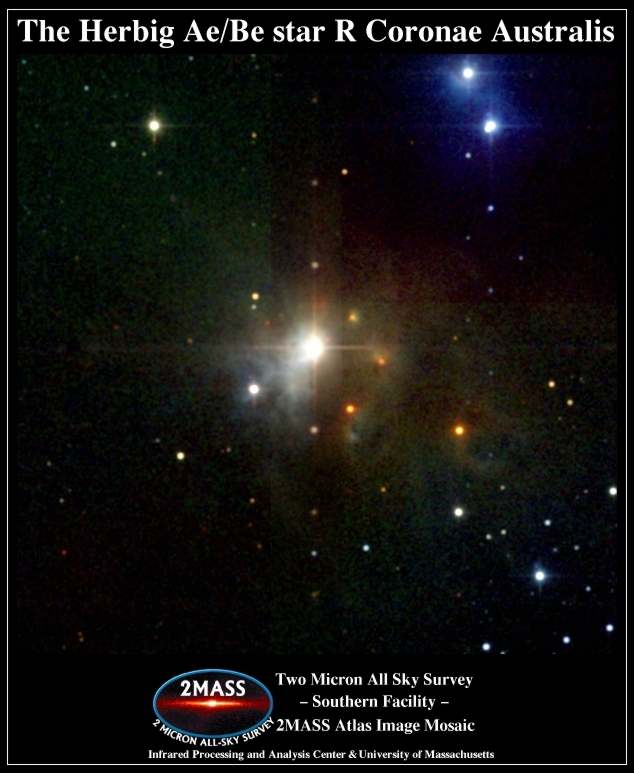 Atlas Image mosaic obtained as part of the Two Micron All Sky Survey (2MASS), a joint project of the University of Massachusetts and the Infrared Processing and Analysis Center/California Institute of Technology, funded by the National Aeronautics and Space Administration and the National Science Foundation. 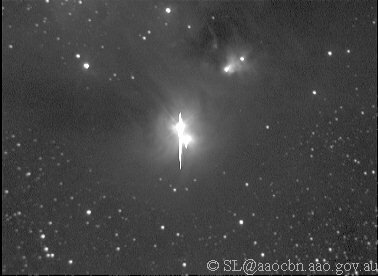 R Coronae Australis lies in the north central edge (19:01:53.65-36:57:07.62, ICRS 2000.0) of Constellation Corona Australis (see David Malin's photo, also at Astronomy Picture of the Day), the Southern Crown -- northwest of Rukbat (Alpha Sagittarii) and southeast of Kaus Australis (Epsilon Sagittarii). The star is located in the Corona Australis molecular complex, one of the closest star-forming regions, which is conspicuously isolated from the crowded galactic plane. 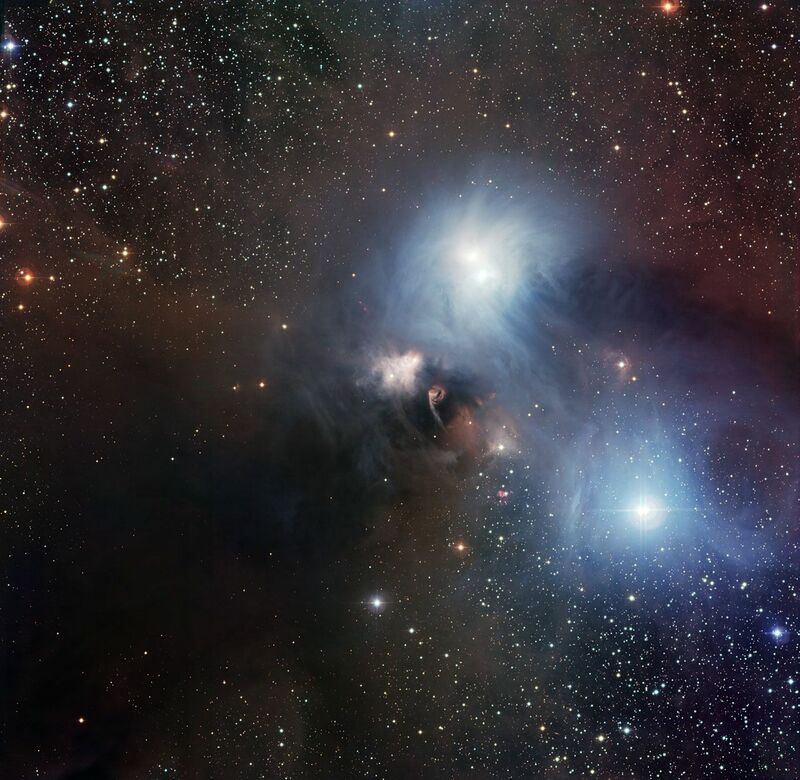 A highly elongated system of dark molecular clouds with six condensations, the complex has a centrally-condensed core ("condensation A") centered near R Coronae Australis. This core measures more than one by two light-years (ly) (0.4 by 0.7 parsecs) in extent and contains about 50 Solar masses of molecular gas (Wilking et al, 1997; and Andreazza and Vilas-Boas, 1996). Space-based, HIPPARCOS parallax measurements that have a high standard error (Plx=122, +/- e_Plx=68 mas) suggest that R Coronae Australis lies around 30 ly from Sol. Astronomers studying the star, which is obscured by interstellar dust, place more confidence on Earth-based parallax measurements and other analysis indicating that the star's location may be around 500 ly away. Such a farther distance estimate is in better agreement with the estimated parallaxes of other stars in the Coronae Australis complex (which may include the isolated nearby neutron and/or quark star RX J1856.5-3754), whose mean distance has been estimated to be around 420 ly -- 130 parsecs (Marraco and Rydgren, 1981). R CrA itself at center of blue nebulae -- larger image. See new image at Astronomy Picture of the Day. As catalogued and defined in Thé et al (1994), R Coronae Australis is defined as a "Herbig Ae/Be" pre-main sequence star with two to 10 times the mass of Sol, which George Howard Herbig originally classified as embryonic stars ("located in obscured regions") illuminating fairly bright nebulosity in their immediate vicinity and of larger mass than the T-Tauri stars already well-known at the time (Herbig, 1960). Of spectral and luminosity type B8 -- previously A5-F0 -- IIpe (Grady et al, 1996, in pdf, page 176), this star is still contracting towards the main sequence (see H-R diagram for pre-main sequence tracks for seven stars of different mass). Although R Coronae Australis is 40 times brighter than Sol (Ward-Thompson et al, 1985), its high luminosity is obscured because the star is accreting matter within an enormous surrounding shell of gas and dust, much of which has already been expelled into space from the poles after being drawn into the forming star via a vast circumstellar disk (Grady et al, 1996, in pdf; and Mitskevich, 1995). There is a bi-polar outflow of molecular gas associated with plasma jets (Hartigan and Graham, 1987, page 4; Walker et al, 1985; and Ward-Thompson et al, 1985). The star is an irregular variable with more frequent outbursts during times of greater average brightness, but it also has a long-term periodic variation of about 1,500 days and about 1/2 magnitude that may be linked to changes in its circumstellar shell, rather than to stellar pulsations (Bellingham and Rossano, 1980). 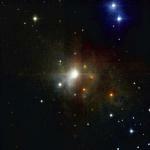 R Coronae Australis has at least twice Sol's mass. It is likely that any protoplanetary bodies that may have formed around the R Coronae Australis star are still agglomerating other planetesimals. Hence, any developing carbon-based life on a developing Earth-type planet would be subject to tremendous heat and intense asteroidal and cometary bombardment. Useful star catalogue numbers for the star include: R CrA, Hip 93449, CD-37 13027, CP(D)-37 8452, Hen3-1733, GCRV 11457, and IRAS 18585-3701. 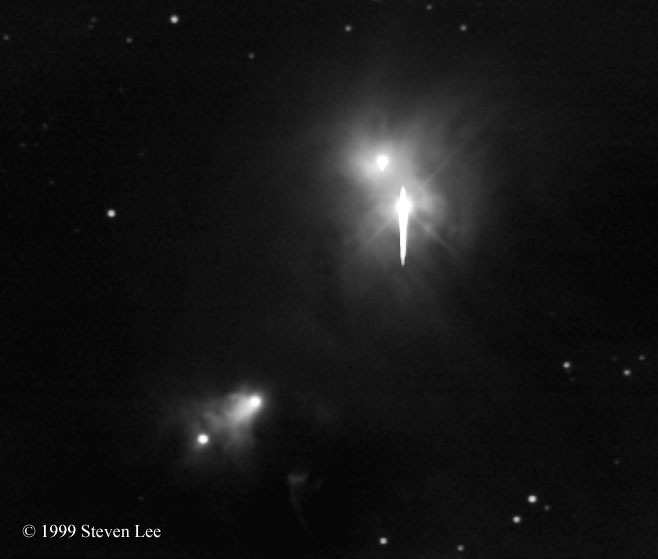 Recent speckle-imaging measurements failed to detect a binary companion (Ghez et al, 1997). A star is probably born as a nebular cloud of gas and dust of interstellar size collapses under gravitational forces (often after a disturbance such as shockwaves from a nearby supernova explosion), and spins inward via an accretion disk towards an increasingly dense core. While still obscured from view by dust, nuclear fusion may ignite at the center of these pre-stellar objects, as hydrogen is fused into helium. Proto-stars (pre-main sequence T-Tauri and more massive stars -- e.g., Herbig Ae/Be stars such as R Coronae Australis ) are born as the energy of core hydrogen fusion pushes outward to balance the inward pull of gravity. This newborn star is about half a million years old. the disk, which has a diameter of about 450 AUs. Before a star finishes forming, around a tenth of the matter around it may be ejected by infalling through its accretion disk and then being blown out by bi-polar jets (more NASA photos) to produce two giant lobes of molecular gas, and bow shocks from the jets hitting the surrounding stellar nebula (painting). Known as Herbig-Haro objects since their discovery in the early 1950s, these lobes typically extend a few light-years in length, have masses similar or larger than the developing star itself, and are moving apart at speeds of tens to a few hundred kilometers (several to tens of miles) per second. Stretching for several light-years, the bi-polar jets may be driven at supersonic speeds by an intense magnetic field at the axis of rotation of an embryonic star less than a few hundred thousand years old. The matter moving outward may carry angular momentum away from the developing star and allow accretion to continue, as well as churn up the surrounding nebula and so provide the necessary turbulence to slow down its collapse. Eventually, the supply of infalling matter will run out and shut down the star's bi-polar jets. Subsequently, much of the surrounding gas and dust that remain around a new star will be blown away, by the young star's radiation in T-Tauri winds after core nuclear fusion is turned on. At around this time, however, large dust grains may be beginning to agglomerate together in a process that leads to planetesimals, proto-planets, and the final planetary system. Hence, once fusion begins at a star's core, planets may have only a few hundred thousand years or so to form from proto-planetary bodies before the dusty circumstellar disk becomes too tenuous, and the star enters the main sequence. Young stars in the solar neighborhood include: many OBA type stars such as Beta Pictoris (A3-5 V), which is young enough to have an easily detectable dust disk; Epsilon Eridani (a K2 V with a dust ring as wide as 60 times the Earth to Sun distance that is estimated to be between one half and one billion years old); and the double-binary system of HD 98800 which has four main-sequence K and M stars that may be only 10 million years old. Up-to-date technical summaries on these stars can be found at the Nearby Stars Database and the Research Consortium on Nearby Stars (RECONS). Additional information may be available at Roger Wilcox's Internet Stellar Database. Despite the position of Corona Australis in the Southern Hemisphere, the Ancient Greeks had named this constellation as the crown of the neighboring centaur, Constellation Centaurus. For more information about the stars and objects in this constellation and an illustration, go to Christine Kronberg's Corona Australis. For another illustration, see David Haworth's Corona Australis. © 1998-2010 Sol Company. All Rights Reserved.